This is not your everyday love story. Adam Rex's humor and wit, match perfectly with Scott Campbell's watercolors in this tale, told through love letters between a clumsy Ox and a graceful, famous Gazelle. For some time now I have wanted to write a letter to say how much I admire you. You are so graceful and fine. Even when you are running from tigers you are like a ballerina who is running from tigers. I think that what I am trying to say is that I love you. 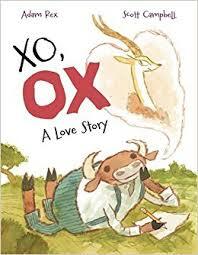 Favorite Line: You make me want to be the best ox I can be. So I thank you again - you are the unflattering light of my life.